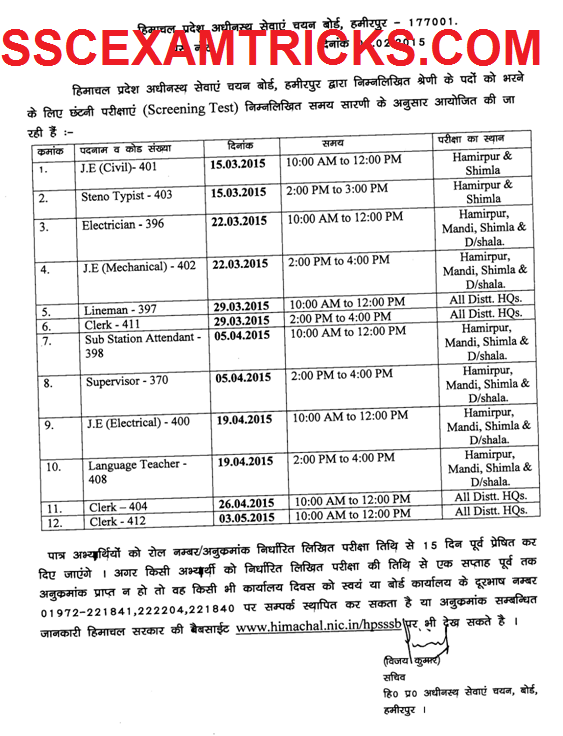 The Himachal Pradesh Subordinate Services Selection Board (HPSSSB) Hamirpur has released exam schedule of written examination which is going to be conducted on 23rd,24th,26th ,27th February 2015 and 1st March 2015 for 60 various posts in various departments i.e. Surveyor, Research Assistant, Senior Draughtsman, Junior Draughtsman, Junior Scale Stenographer, Field Investigator, Junior Draughtsman(Electrical), Ayurvedic Pharmacist and Senior Assistant (Accounts) at various centres in predefined centres. A huge numbers of candidates had applied for these posts from all over the state. Those candidates who had applied for these posts can downloads their admit cards from the direct link provided in the end. It is mandatory for the candidates to bring downloaded admit cards. Candidates are advised to note down the venue of exam and read all the instruction provided at the bottom of the admit cards. Candidate must ensure the documents required such as ID proof i.e. driving license, PAN card etc. before appearing in exam. Candidate must bring at least one photocopy of ID proof to the venue of exam. Candidates have to affix colour photograph in printed admit card to the provided space. Admit Card must be signed properly below the Colored photograph paste by the candidate. It is noted that use of mobile phone/Calculator/Electronic gadgets is not allowed in exam room. The selection of candidates will be done through a merit list which will be based in the performance of candidates in written exam and interview marks obtained by the candidates. The Exam schedule for written exam has been released on 07th February 2015. The written examination will be conducted on 23rd,24th,26th ,27th February 2015 and 1st March 2015. The written examination will be conducted on Pen Mode. An OMR sheet containing circle and information regarding candidate name, roll no., question serial number etc. will be provided on either or one side of the sheet. Candidates are required provide answer by filling circles by pen in particular manner / proper way. The question paper will be of Objective type screening test (MCQ) of syllabus of subject concerned stream/course/trade containing question from General Knowledge including General Knowledge of Himachal Pradesh, Current Affairs, Every day Science, Logic, General English & General Hindi of Matric standard. The total marks of question paper will be 200 Marks which will need to be completed within predefined period of time. Interview of those who qualify objective type screening test will be conducted for 30 Marks.